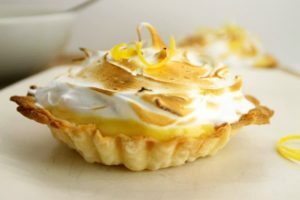 An old school classic, lemon meringue tarts and pies are velvety, tart, yet sweet, and oh so delicious. These mini lemon meringue pies make the perfect dessert for a spring brunch or other special occasion. While the traditional lemon meringue pie is no more complicated than the recipe I will share today, my variation keeps all the different parts separate right until you want to assemble and serve the tarts. 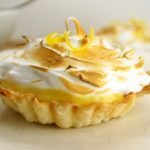 This makes the lemon meringue tarts easy to prepare ahead of time, and require almost no baking! The meringue is usually what keeps people from making this classic dessert, and is very similar to making a pavlova. I will walk you through all the steps, resulting in a fool proof professional looking tart for you to serve to your friends and family. Before starting this recipe, there are a few pieces of kitchen equipment you may want to double check are in your cupboard. 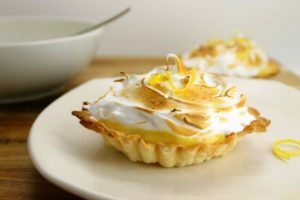 Because the lemon meringue tarts are ‘no-bake’ you will need a mini blow torch or a broiler to caramelize the tops of the meringue after assembling. You’ll also want to make sure you have little tart molds or a muffin tin in which you can blind bake the tart crusts. As with any pie or tart, you will need to make a pie dough. I would suggest making this classic pie dough recipe from scratch, it can easily be made the night before in just five minutes. You could always buy a pre-made tart shell though if you wanted. BUT it will always taste better if you make it yourself, guaranteed!
. (affiliate link). They are well worth the investment, especially since they are one of the cheaper pieces of kitchen equipment you can buy. They are more durable, the removable base helps prevent stuck tart shells, and if taken care of properly, will last you a lifetime. The perfect addition to any budding chefs or bakers tool kit! Roll out the circles of dough until they are roughly twice the size of the tart molds. Place the dough into the buttered tart molds, making sure to keep a quarter of an inch above the rim of the mold. This excess dough will slightly shrink while the tart base bakes. Cut out a small square of parchment paper and place this on top of the dough in the mold. Weigh the tart dough with pie weights, or lacking those you can substitute dry beans, lentils, or rice. 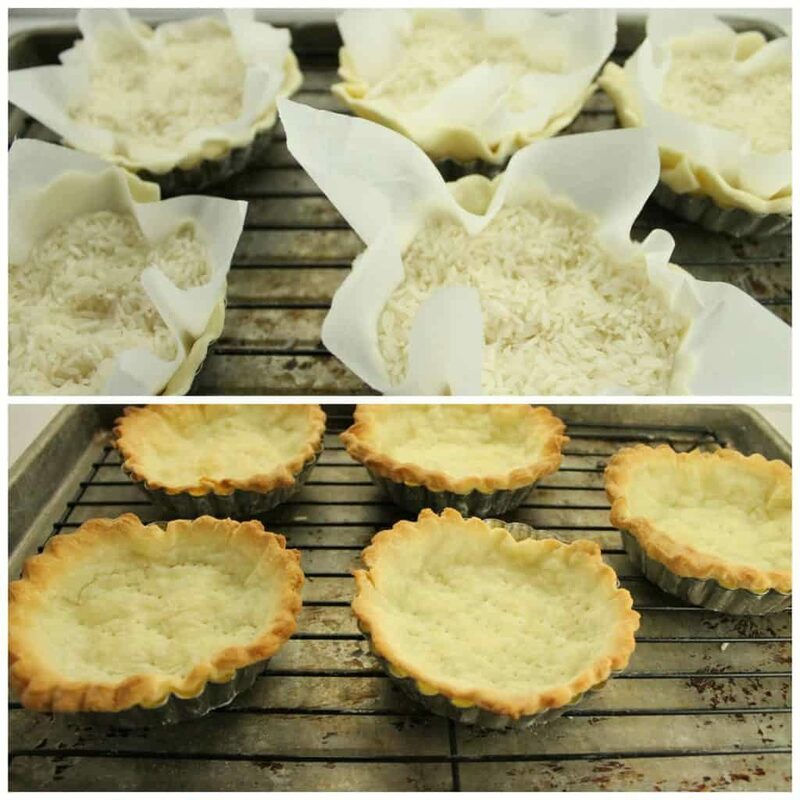 The weight is placed in the tart shells when blind baking to prevent the base of the dough from bubbling up. Halfway through the baking you will need to remove the parchment and weights to allow the base and sides to properly brown. Pre-heat your oven to 400F and then place your weighted tart shells in the fridge to chill. Once cold, bake the tart shells in the oven for 8-10 minutes until the edges slightly start to brown. Remove the parchment and weights and continue to bake the tarts for 5-8 minutes until they are light golden all over. Remove from the oven and cool on a wire rack in the tart pans until you can remove the shells with your hands. Set these aside while you make your lemon curd and Swiss meringue. Lemon curd is simply a lemon flavored egg custard that is cooked, cooled, and then spooned into the blind baked tart shells. This prevents us from having to bake these little lemon meringue tarts. Mix the lemon juice, sugar, and egg yolks in a small sauce pot and stir until everything is well combined. Slowly heat this mixture in the pot until it starts to slightly thicken. It should barely coat a spoon and drip off in a thick ribbon. 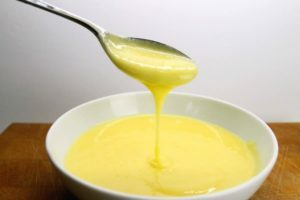 Add your cubed butter to this thickened curd and stir in until it is completely melted. The butter will add a nice gloss to the lemon curd and give it a richer taste. It will also take a bit of the tang off of the lemon. Cool the lemon curd in the fridge, keeping in mind that it will continue to thicken as it cools. For this recipe, I decided to use Swiss meringue instead of common French or Italian meringue. Swiss meringue is best used as a topping or as an icing which is meant to be eaten right away and needs no further cooking. The eggs are cooked to 160F (unlike in French meringue which uses raw egg whites) as the egg white are beaten in the bowl. French meringues are usually used when the product is baked afterwards such as in a pavlova, macrons, or the traditional lemon meringue pie which is baked in the oven like a regular pie. Meringue is essentially a combination of egg whites mixed with sugar which then has air whipped into it. The sugar helps stabilize the small air bubbles that are created by whipping the egg whites, creating a fluffy light product. The more sugar you add, the glossier and denser the meringue will become. As a rule of thumb, you want almost twice as much sugar as egg whites by weight. Every so often they do go on sale and you can get them at a good price. As a professional Chef, I can attest to its quality and I am lucky enough to say that I own one personally, and use it quite frequently to cook, and even bake my own homemade sandwich bread in it! Other brands simply do not do as good of a job long term and do not offer the same amount of attachments as a KitchenAid does. Regardless of what mixer you end up using, you need to whip the egg whites and sugar until it forms a fluffy mixture that will form little peaks and “stand up” on its own. Put all the ingredients in your mixing bowl. Heat a pot of water on the stove until it is just barely simmering, and stir the egg mixture over this hot water to slowly pasteurize the eggs. Traditionally Swiss meringue is only cooked to 104F (40C) but in order to pasteurize the egg whites and make them safer to eat, I will cook them to 160F (71C). Stir the eggs the entire time to make sure they do not curdle and turn to scrambled eggs. The sugar that is mixed in should help prevent this and the whole thing should turn into a soupy sticky liquid. Once the egg mixture reached the desired temperature, place the bowl on your mixture and with a whip attachment whip the egg whites on medium-high, until they are light, glossy and have cooled. 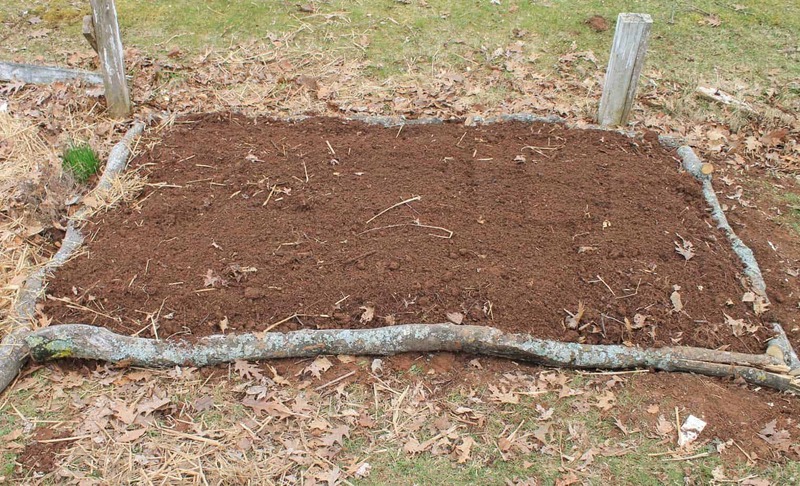 The end result should hold nice firm peaks on its own and have almost a marshmallow like consistency. Once you have all your components finished you can assemble the tarts right away or pack everything up separately to take with you if you are serving these at a location other than your home. Once assembled slightly torch the meringue with a broiler or blow torch for a nice browned effect. Garnish the tarts with a little lemon zest and you are all ready to go! These no-bake lemon meringue tarts are perfect for a Spring bunch dessert or served at any special occasion! Prepare all the components separately, for easy assembly before serving! Roll out the pie dough to about 5 millimeters thick. 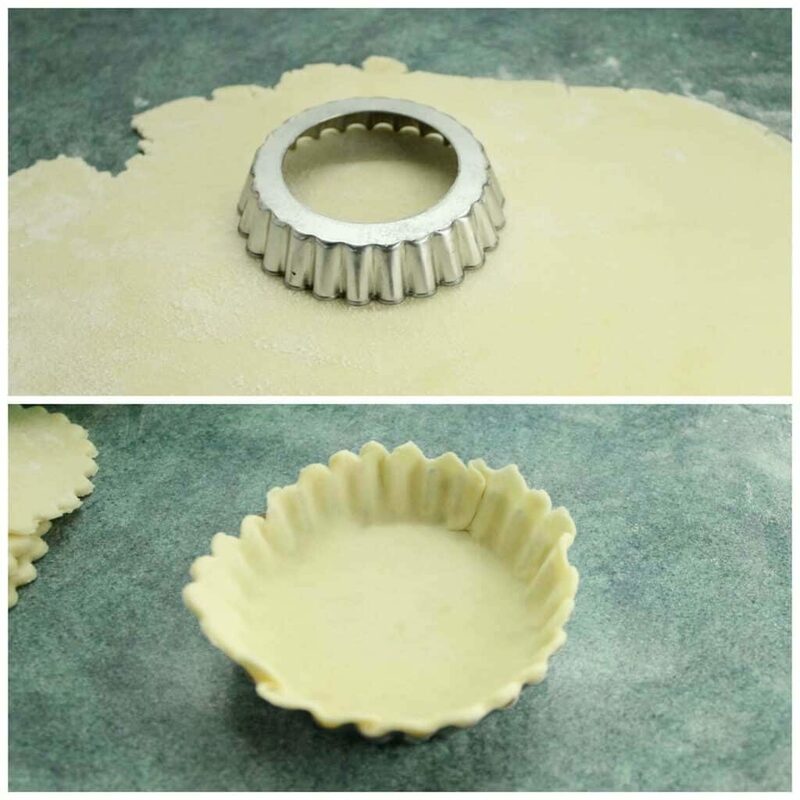 Cut out circles with your tart pan, and then roll out the the tart until it is roughly twice the size of the mold and 2-3 millimeters thick. Place the rolled out dough in greased tart pans, leaving a little excess to allow for shrinkage. Weight the dough with parchment paper and pie weights then chill until the tart dough is cold. Bake in a pre-heated 400F oven for 8-10 minutes. Remove the pie weights and continue baking for another 5-8 minutes or until the shells are golden brown all over. Mix the fresh squeezed lemon juice, 1 cup of sugar and egg yolks in a sauce pot. Whisk together until combined and then STIR the pot until the mixture begins to thicken over medium heat. Stir in the 1 Tbsp of cold butter. Start a double boiler on the stove. Mix the 5 egg whites and 250 grams of sugar with the vanilla extract in a bowl. Over the double boiler stir this egg mixture carefully until the temperature reaches 160F to pasteurize the eggs. 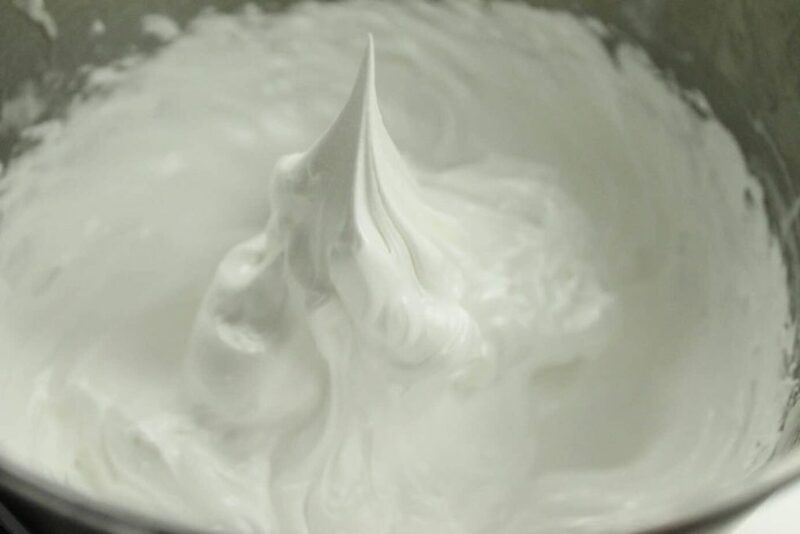 Take the bowl of the double boiler and either with a stand mixer or by hand whip the meringue mixture until cool and stiff peaks form. The texture should be similar to marshmellows. Assemble the lemon meringue tarts by spooning the chilled lemon curd into the cooled tart shells. Top with the Swiss meringue and lightly brulee the top with a mini blow torch or broiler. 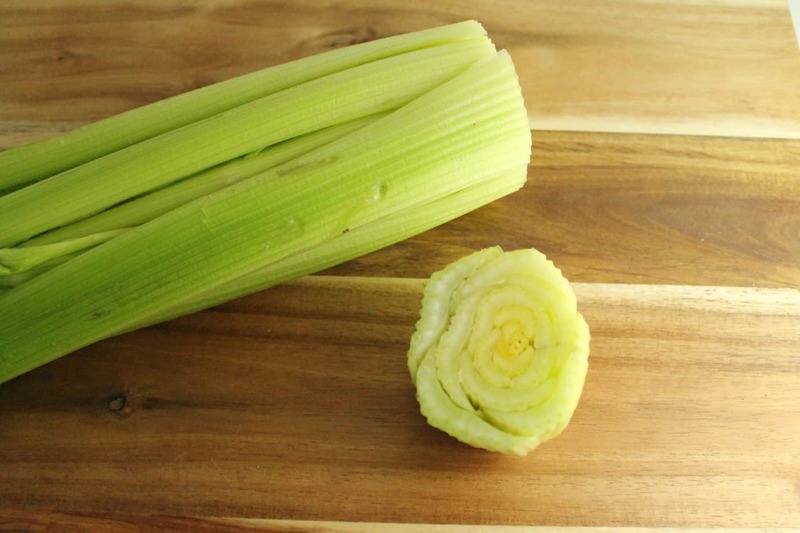 Garnish with a curl of lemon zest. I have a bunch of lemons…and these look fantastic. I love lemon anything so these really would be perfect for me on Mother’s Day!! These are so lovely! They look amazing and as a mother, would be thrilled to have these as dessert on Sunday! Thanks Carrie!! I wish I could make them for my mother this year, but I unfortunately won’t be making it home this weekend.Always next year though! So my mother WOULD love these 🙂 Lemon Meringue pies are her thing and they are one of they few recipes she will not let me have. One this she always told me was for the meringue to make sure the bowl was ice cold when you brought the eggs and sugar together. Do you follow that technique as well? If you are making a regular frenxh meringue that will be baked in the oven, yes make sure the bowl is cold.In the recipe above though i chose to make a swiss meringue in which you cook the eggwhites and sugar to 160F before whipping. This makes them safe to eat right out of thw mixer.They will be marshmallow like in texture and make a great topping for tarts and cakes! Lemon is one of my favourite flavours! Yummy tarts!